We are just starting to dig into our fall wardrobes, just as stores are feverishly marking down winter attire to make room for spring merchandise. If that feels a little escalated, think about this: designers are showing their “pre-fall” collections, which will ship into stores in mid to late 2015. The good news is, that there are trends for next season that you can start gearing up for now; often at 30% off! Designers are borrowing from the boys next season, with many showing classic menswear elements with quirky new proportions and luxe fabrications. Gucci showed grey flannel trousers, cropped above the ankle, with a bejeweled version of a crew neck sweater and shirt. It’s topped with a chic camel coat and worn with tricolored high heeled oxfords. Nab it now: A classic camel coat, and a shetland or cashmere sweater. Bonus points for finding cropped trousers. 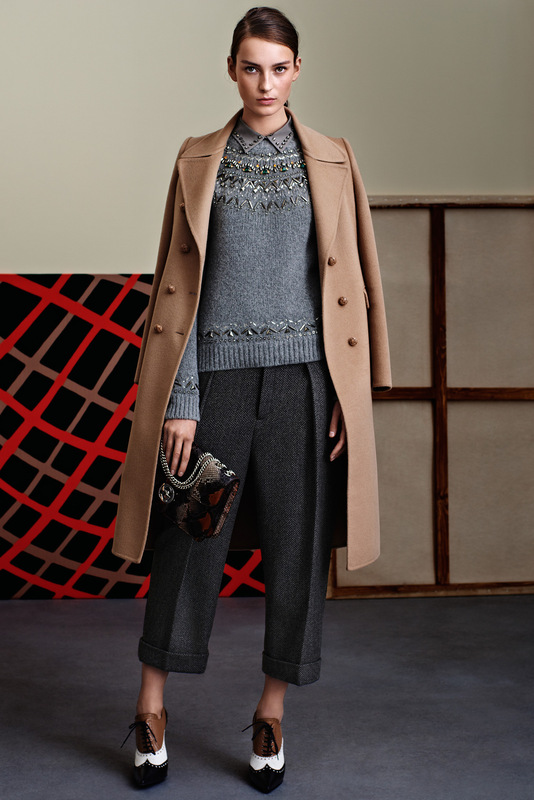 Gucci also showed a Fairisle sweater over slim ankle skimming tweed pants. Nab it now: It is prime time for this type of sweater, which tends to make it’s appearance near the holidays. Pick one up on sale and love it even more next fall. Michael Kors plays black and white polka dots off of cropped trousers in a salt and pepper donegal. Love the saddle shoes and crisp white shirt! Nab it now: You can never have too many white shirts, so finding the perfect one on the sale rack is a coup. That polka dot sweater might be kicking around somewhere, so be on the lookout. Kors kept the classic sweater and shirt look going, this time pairing it with crisp denim with a wide cuff. That (faux) fur jacket pulls it all together and makes it look new. Nab it now: Again, look for the classics, including button down shirts and crew neck sweaters. Camel or grey seem like winning shades to pick up. If you stumble on a great faux fur jacket in a retro-modern silhouette, grab it! Gucci also showed pulled together denim, although more distressed than Kors. The patterned sweater and shirt combo under a piped peacoat brings richness and texture into the mix. Nab it now: Outerwear will be at major discounts soon, and you can’t go wrong with a chic take on a peacoat. Be on the lookout for non-Christmas-y versions of patterned sweaters. How great does this outfit look from Rebecca Taylor? An oversized, chunky sweater and a new riff on the jean jacket top a lacy feminine skirt. Nab it now: Holiday skirts in lace, feathers or other interesting textures will be going on sale any minute now. Pick one up to pair back to a longer, chunky knit sweater, which you might just find out there too! Oxford shoes, especially two toned versions seem to be great finishing touches. Keep your eyes peeled for some to update your look right now. This entry was posted on December 11, 2014 at 7:07 am and is filed under fashion. You can follow any responses to this entry through the RSS 2.0 feed. You can leave a response, or trackback from your own site.